1. A dark nail polish. My favorite is OPI's Russian Navy! 2. A moisturizer/lip balm. This multi-use item is a one-stop shop at fighting the chilly breezes! 3. Cardigans. Thin, chunky knit, whatever. 4. Boots. Nothing like comfort and warm feet put together. 5. Statement jewelry. Liven up those sometimes drab fall outfits! 6. Berets. So Parisian, and so fun! 7. Scarves. I love the many different ways they can be tied! Those things above pretty much make up my everyday outfit during fall days! 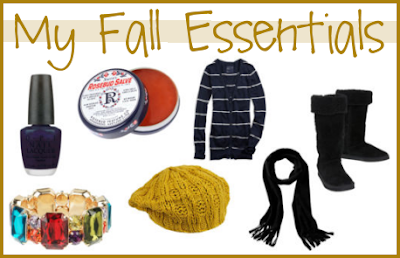 Do you have fall essentials you can't live without? A smoky eye everyday? Red lips? Sequin clutch? Tell me about your must-haves for this season!